The Doves are another one of those arena-filling rock bands that were so popular in the UK in the early 00's. This all started with U2 of course and went on to the Coldplays of this world. However the Doves are slightly more interesting than most, comparisons to Coldplay are justified here but they are not nearly as annoying or commercial as Rush of Blood to the Head Coldplay, this feels a lot more honest, while still relying on big guitar hooks and a full sound. That being said the album isn't spectacular, there are a couple of very good songs and a lot of dross. They are however perfectly respectable to listen to, it probably won't annoy many people in the same room, so kudos. 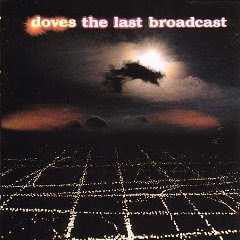 The album was produced by Doves themselves, with additional production from Max Heyes. Steve Osborne produced "Satellites" and co-produced "Caught by the River" with the band. Guest musician Sean O'Hagan also arranged the strings, brass and woodwind instruments for "Friday's Dust" and "The Sulphur Man." The first single from the album, "There Goes the Fear," entered the UK Singles Chart at #3. Agreed on the great tracks vs. filler ratio on this one. Their first album, "Lost Souls" is superior IMHO.